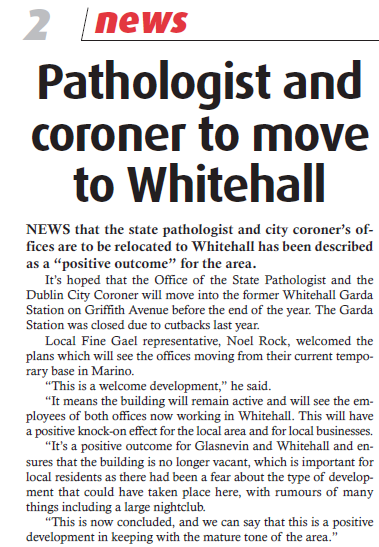 Fine Gael Local Representative Noel Rock has welcomed plans to move the Office of the State Pathologist and the Dublin City Coroner to the former Whitehall Garda Station on Griffith Avenue. Commenting on the move to Dublin North West, Mr. Rock said: “This is a welcome development. It means the building will remain active and will see the employees of both offices now working in Whitehall. This will have a positive knock-on effect for the local area and for local businesses”. 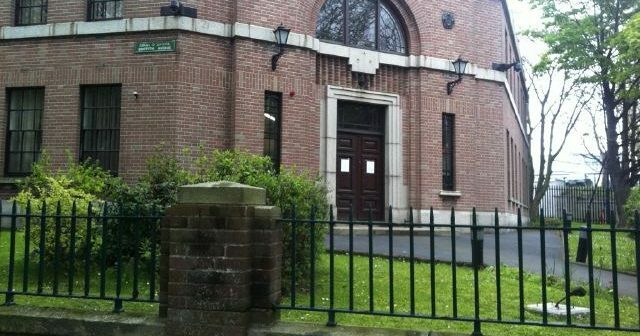 The development, which was highlighted by Mr. Rock following an Office of Public Works statement on the matter, will mean that the offices will now move from their temporary base in Marino to Whitehall and will remain there, according to Minister of State Brian Hayes “for the foreseeable future”. Mr. Rock concluded: “This is a positive outcome for Glasnevin and Whitehall and ensures that the building is no longer vacant, which is important for local residents as there had been a fear about the type of development that could have taken place here, with rumours of many things including a large nightclub. This is now concluded, and we can say that this is a positive development in keeping with the mature tone of the area with little traffic and disruption to local residents”.